I just kind of love this time of year. There’s something just so magical about September – December, with the back-to-school and back-to-routine excitement, October with Thanksgiving and Halloween, and I’ll be honest from October to December is all about Christmas for me. I love Christmas, probably because there are so many reasons and opportunities to gather around a table of good food with friends and family. Because really — what is great food without great people to share it with?? So here we are in November, and I’m bringing you something that will be a show-stopper on your holiday tables. This White Chicken Lasagna is basically all of my favorite components of a main dish right here: pasta, cheese, a creamy white (healthier!) Alfredo sauce, ham and chicken. It is unreal, you guys, and Catelli Express lasagna noodles make it so, so quick to put together. (And since we’re celebrating 150 years of deliciousness from Catelli this year, I see no end in the reasons to indulge!). I chose to make my own Alfredo sauce, even though you could use a store bought variety, because it allows me to control things like salt, sugar, and fat a bit more and add in extra goodies like spinach. The sauce can easily be made ahead of time (up to 2 or 3 days even) and stored in the fridge until you’re ready to assemble, which makes this even more doable for those sometimes hectic family reunions or gatherings of friends around the holidays. Lasagna is one of my ultimate comfort foods. Isn’t it everyone’s?? The presentation, with the layers of pasta, sauce, cheese and meat, is so pretty and takes this dish right to center stage on a crowded holiday table. I would love to hear how you guys make things a little easier on yourselves when you’re planning meals around the holidays? Any great make ahead tips or things you keep on hand to help with meal prep? Ideas for treats that look extra special but are easy to pull off? I’d love to hear about them! Feel free to add extra veggies to this lasagna: mushrooms or roasted red peppers would be great in this! 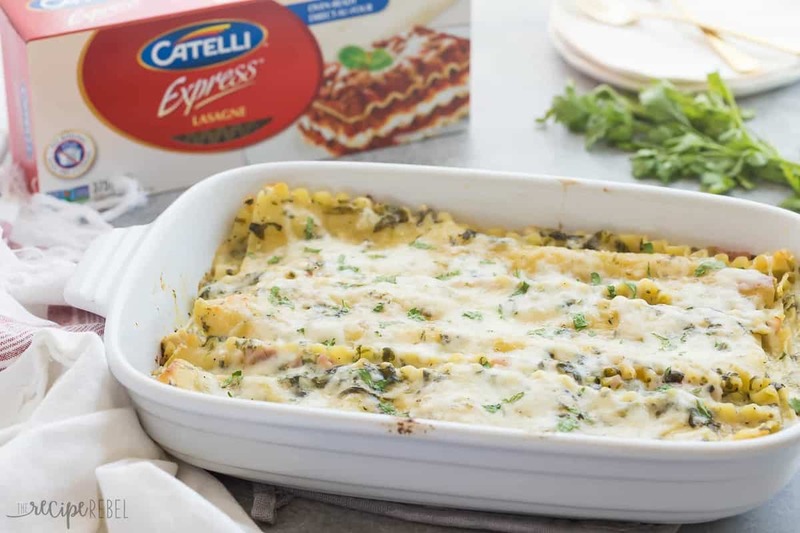 *This post is sponsored by Catelli — thank you for supporting the brands that help us to bring you these delicious dinner ideas! 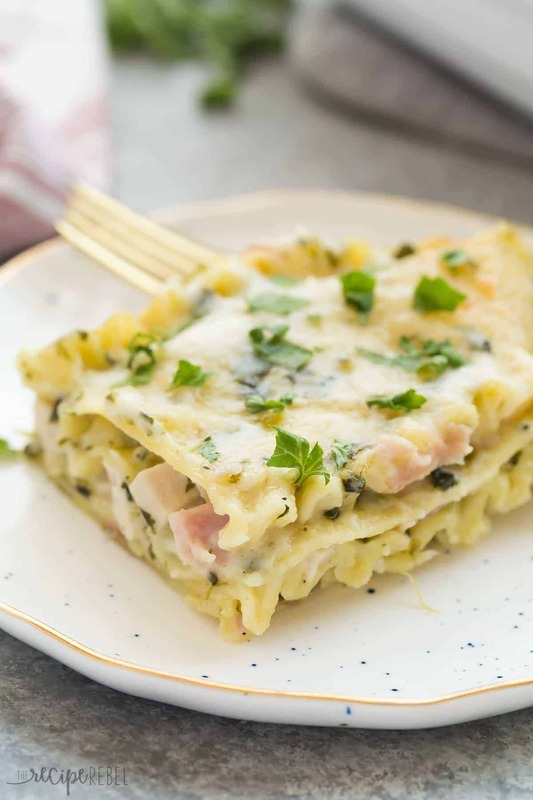 This White Chicken Lasagna with Ham and Spinach is the ULTIMATE comfort food! Made with a lighter Alfredo sauce, it's decadent enough for Thanksgiving or Christmas and still loaded with healthy ingredients. Melt butter in a medium pot over medium heat. Add garlic and cook 1 minute. Stir in flour until completely combined. Whisk in broth and milk, and continue cooking over medium heat until sauce has thickened considerably. Stir in spinach, 1/2 cup mozzarella cheese, 1/2 cup Parmesan cheese, salt, pepper and nutmeg if using. Set aside. Preheat oven to 350 degrees F and lightly grease a 9x13" baking dish. 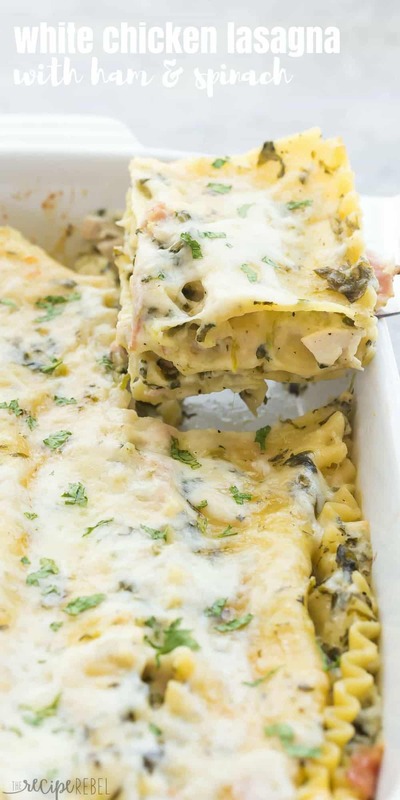 Spread a thin layer of sauce in the bottom of the baking dish, then top with 3 lasagna noodles, 1/4 of the sauce, 1/3 of the chicken, 1/3 of the ham and 1/3 cup Mozzarella cheese. Repeat layers twice so that you have 3 layers of 3 lasagna noodles each. Top with remaining 3 lasagna noodles, remaining 1/4 sauce, 1/2 cup mozzarella cheese and 1/2 cup Parmesan cheese. Cover with a lightly greased piece of foil and bake for 40-45 minutes until noodles are tender (they will absorb the sauce and expand as they cook!). Remove foil and broil 2-3 minutes until lightly browned if desired. Let sit for 10 minutes before slicing into 9 pieces and serving. I poach my own chicken breasts for this recipe. To do this, simply heat about 1" of chicken broth in a medium pan to a simmer over medium heat. Add two raw chicken breasts, cover, and simmer (don't boil) for 10-15 minutes until cooked through. Let cool enough to chop. I assume the. Oodles are cooked first before combining? This looks great! So creamy and decadent. Think I’ll try this lasagna, minus the ham, since I don’t eat pork. Looking forward in eating a warm batch of lasagna in this chilly weather! I don’t like turkey, so I always make a ham for Thanksgiving/Christmas/Easter, and never know what to do with the leftovers. This looks perfect!